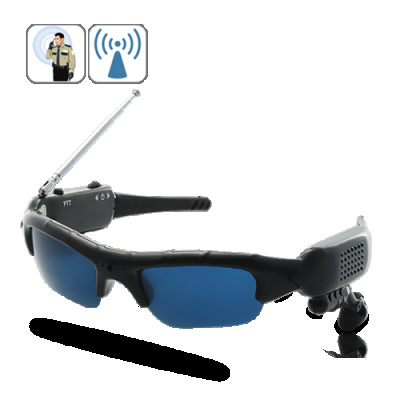 Successfully Added Walkie Talkie Sunglasses with 500M Range (2-to-8 Way Wireless Communication) to your Shopping Cart. Communicate in style with these walkie talkie sunglasses. Featuring multiple channel support, a long 500 meter operational range, and a built-in battery, this is an extremely well-rounded and powerful communication device. Whether you're out on a hike, paintballing, hunt, or even out with the family, these walkie takie sunglasses will easily keep you connected with others. Perfect for emergency communications, battlefield coordination, or a quick potty break on a road trip. To protect your eyes from harmful solar radiation, it can also provide critical protection from the sun’s damaging ultraviolet (UV) rays. Even better, frames with a close-fitting wraparound style provide the best protection because they limit how much stray sunlight reaches your eyes from above and beyond the periphery of your sunglasses lenses. Most importantly, these two-to-eight way radio walkie talkie are very powerful long-range voice communication devices. They have multiple benefits over cellular phones including - Instant Communication, Easy to Talk with Multiple People at the Same Time, Free to Use, No SIM Card or Monthly Fees Required, and much more. With these walkie talkie sunglasses, you can easily and freely talk with up to 7 other people at once. Imagine you playing Paintballing with your friends or hunting in the forest- all you need is wear this hand free walkie talkie sunglasses, then communicate like a professional; “10-4 Alpha Team, 10-99 Zone 5 Go, go, go”, and live the dream of a pro, relaying commands through a walkie talkie whilst rushing through the jungle in pursuit of the enemy… Extremely convenient!! Functional and fashionable, these walkie takie sunglasses are the best choice for outdoor enthusiasts, indoor events, and even for fun between you and your friends. Buy one for yourself today, or order in bulk to sell and profit. Available from your best source for wholesale electronics, Chinavasion. Please note: This product only comes with a SINGLE walkie talkie. Also, these devices will ONLY work with each other (up to 8 devices at once), not any other walkie talkie. The frequency can not be changed. If I buy 8, will all of them be able to talk one another?